There is, though, a difference. Fuller makes no bones about his preference for plain talk. Mahon’s endorsement of Tolstoy is far less straightforward. The Tolstoy who prefers “doorknobs, utensils, toys and song, / the homespun that the peasants wore” is also the man who “disapproved / of operas, plays, and novels”. While Mahon may in some senses be conservative, and while he himself has never attempted “experimental modes of writing”, he most certainly doesn’t disapprove of what is often called “high art” – operas, plays and novels. Steare notes that Mahon is devoted to translation, and has made adaptations of, among other poets, Ovid, Propertius, Pushkin, Baudelaire, Rimbaud, Rilke, Jacottet, Valery, [he might also have mentioned Mahon’s brilliant version of Lucretius’s writing on clouds]; he has adapted for the theatre Euripides’ Bacchae and Racine’s Phaedra; and he is a great admirer of the novels of Patrick Hamilton and Brian Moore. This is about as far from any suggestion of the homespun as can be imagined. Mahon is, in fact, an immensely sophisticated poet. The range of reference and allusion – which I suppose is what Steare, in the act of tugging a forelock to critical theory, calls “intertextuality” – would, at a guess, put most self-styled experimental writers to shame, and is done without fuss or self-advertisement. 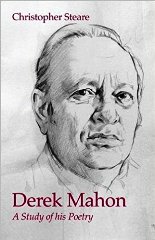 In this he is very unlike Geoffrey Hill, whose insistent allusiveness is accompanied by an egotistic contempt for what he perceives to be (or anyway treats as) the philistine bone-headedness of others. I’ve no idea whether Mahon’s poems, whose layers of meaning-through-allusion Steare ably unpacks, “challenge nervous readers”; if so, they should be reassured by this critical study. Steare writes lucidly, intelligently, and with notable attention to Mahon’s great compositional skills, his mastery of rhymes, metrics, and stanza forms. Mahon may be reclusive but he isn’t arcane. And to argue that because Mahon is a formalist and doesn’t like much in contemporary culture he must be “conservative” is silly. Is Tony Harrison, that master of the sonnet and tight rhyming, whose translations of, say, Aeschylus and Moliere, are among the great accomplishments of our age, to be thought of as “conservative.” Poetic forms of themselves are emphatically not conservative or radical, and it is nonsense to suggest that they are. I don’t accuse Steare of making this mistake, though he comes perilously near it when, in an otherwise splendid account of the poem “St. Patrick’s Day”, one of the verse letters of which Mahon is an absolute master, he tells us that the last stanzas reveal the poet as “a cultural critic … a terminal ironist contemplating the irony of writing in a ‘post-literate’ world.” This is both right and wrong. Mahon certainly is a cultural critic, but the adopted position of terminal ironist is a strategy. Its adoption makes possible Mahon’s excoriation of Yahoos on their mobiles “triumphant in the market place.” If this is terminal it is so in the sense that Pope recognised when, at the end of The Dunciad, he writes “Thy hand, great Anarch, lets the curtain fall, / And Universal Darkness buries all.” Universal darkness can’t bury all, not while Pope is around. And Mahon, too, bears witness against the dark. Steare, it should be said, knows this perfectly well. But when he writes that Mahon uses an old typewriter on which to send out his poems – by “snail mail”– and that in doing so, and in making his “defence of a slower, more contemplative relationship to ’reality’ however defined …. He aligns himself with other refuseniks, dissenters, who have rejected the cultural consensus,” I want to ask in what way this can be called conservative, especially as Blake is said to be one of these dissenters, and that, according to Steare, among others in some ways dear to Mahon’s heart are Sartre, de Beauvoir, and Rimbaud, the last of these celebrated by Patti Smith in words Mahon himself quotes: “the real earth of Rimbaud.” But then elsewhere Mahon mentions such luminaries of the world of popular music as Bob Dylan and the Beatles, and in “The Globe in Carolina” he concludes one stanza by saying “Night glides inland from town to town ./ I love to see the sun go down.” Steare misses the allusion here to W.C.Handy’s “St Louis Blues”, but given the number of allusions he does pick up and whose relevance he expounds I don’t hold this against him. He is undoubtedly correct to argue that these allusions are frequently part of the evidence Mahon slyly and/or dolefully and/or wittily and/or despairingly and/or comically assembles against the detritus of modern living. But what drives Mahon to his typewriter is the need to write a poem, to exemplify what it is to be a poet, not by assertion, but by providing the evidence. Hence, Mahon’s quizzical-celebratory collection The Yellow Book, a revisiting of the 1890s when, as Yeats said, a poet would not make a “poorer verse / That he might have a heavier purse.” Steare ably notes how Mahon’s proclaimed readiness to “keep alight the cold candle of decadence” is double-edged, an affirmation and at the same time a self-conscious, slightly absurd form of posturing, and that his renunciation of the common dream for something more “precious” is knowingly double-edged: the word means on the one hand an object of great price and, on the other, what is over-refined and affected. To his immense credit Steare is always alert to and wanting to concentrate on Mahon the artist craftsman. To take one example. Writing of “A Swim in Co Wicklow”, Steare quotes the lines “A quick gasp as you slip / into the hissing wash,/ star cluster, dulse and kelp ,/ slick algae, spittle froth,/ the intimate slash and dash,/ hard-packed in the seething broth,” and remarks of them that “This is language at its most densely auditory ….To read it aloud is to experience an almost physical participation n the thing being described.” This may be obvious, but it is well worth saying, especially as those who set themselves up as critical theorists never do say it. “No ideas but in things,” Carlos Williams famously proclaimed. “No things but in language” you can imagine Mahon countering. But countering isn’t the same as confrontation. Steare, as I have noted, says that Mahon is “notoriously bad at self-promotion.” Well, good for him. But we must note that Mahon does promote the art of poetry and not merely through his own work. As I can testify from my own experience, he also promotes, or anyway used to promote, the cause of literature in a more general sense. At the beginning of the 1980s he asked me to become poetry reviewer for the New Statesman, of which journal he was then called poetry editor. As far as I could tell this required him to choose a poem or two for each issue from the torrent that flooded into the office in Great Turnstile Street and also to choose which collections of new verse should be sent out for a review. Not especially onerous tasks, perhaps. But it soon became clear to me that Derek was to all intents and purposes the literary editor. He never spoke a word about this, and if you consulted the editorial masthead you would find that an entirely different person was said to be in charge of the back half of the journal. But it was pretty obvious that Mahon was very influential in recommending books for review and I am not alone in sensing that he also had much to do with then suggesting suitable reviewers. As a result the book pages of the Staggers of that period were required reading. Mahon, you could say, did good by stealth. And to anyone who cares about the state of poetry today, and as Christopher Steare’s book demonstrates, he still does. As does Anne Stevenson. About Poems consists of seven lectures, three of which were given at Newcastle as this year’s Bloodaxe Poetry Lectures, three at Durham University where Stevenson is Poetry Fellow, and one at the 2013 Ledbury Poetry Festival. The last is a re-visiting of Bitter Fame, her biography of Sylvia Plath, which, when it first appeared in 1989, was as predictably as it was unfairly attacked by both Hughesians and Plathians, none of them greatly interested in poetry but all of them signing up for a cause. In the heat and dust of this battle, Stevenson, who is interested in poetry, stood little chance of a fair hearing. Now that the air has cleared, she is able to re-state her case, which she does with a kind of adamant good grace. Her argument, that the major, even determining causes of the poet’s suicide may well have been due to an incompetent administrator of the ECT Plath underwent after her suicide attempt at the age of twenty, and, later, the eager (mal)administrations of a psychotherapist, Dr Ruth Beuscher, who convinced Plath that the root of her breakdown lay with her father’s death when she was only eight, seems to me as persuasive as anything I have read about the poet’s life and tragic death. It probably won’t persuade those flat earthers who know it was all Hughes’s fault, or, of course, Plath’s, but then what would? They certainly won’t care two hoots about Stevenson’s subtle analyses of Plath’s poems. Brief though these inevitably are, they are models of how poetry criticism should operate. And this is true of all the discussions in About Poems, which between them provide a master-class in how to read poems. The Newcastle lectures, it’s true, also provide general considerations of poetry: “Poems for the Voice and Ear”, “The Anthology as Manifesto 1960-1980”, and, deliberately provocative this one, “What is Poetry?” All are interesting, the last especially so in that Stevenson speaks with discriminative warmth about the work of three poets whom, I imagine, aren’t widely known: G.F. Dutton, Frances Horovitz, and William Martin. Stevenson makes convincing arguments for the worth of all these, as a result of which she earns the right to say to her audience, “I wish I could convince you that prizes, such as they are today, are misleading goals for poets…. To judge a poem as good or bad on the basis of what a former prize winner or famous name finds easy to approve, without taking into account how it is made and what it sounds like, is bad for poetry.” Amen to that. Still, it has to be said that the work of the Black Mountain poets is very different from Yeats etc. and not merely because it replaced “history” with “geography.” My own memory of Olson’s “revolutionary” moment is of the freedom it gave to compose by type-writer space rather than the line. (Type-writers were modern, the pen was yester-year’s technology.) In practice this most often led to lines or broken-up “unit lengths” which looked pretty much a jumble on the page – uneven gaps, arbitrary line-breaks – and which couldn’t really be spoken as they were set out, although Robert Creeley’s rather beautiful snakey lyrics had an unmistakable rhythmic propulsion to them as well as a witty take on white American mores, as in “I Know a Man”. This was taken further by Ed Dorn, who is surely the most substantial of the poets who are at all indebted to Olson, although he often goes on too long and – even in his masterpiece, Gunslinger, can be held guilty of a formless sprawl. Taking their cue from the Master’s Maximus poems, the more hapless admirers of Black Mountaineers used to argue that this sprawl was mimetic of America itself: geography rather than history defined the nation. I doubt that this assertion any longer has credence. As the latter-half of the twentieth century alone makes evident, America has decisively contributed to, even shaped, modern history, something many of its finest poets – Lowell and Louis Simpson, for example – have recognised. Stevenson devotes some attention to the urgent politicisation of Denise Levertov’s poetry and more broadly she notes that by the beginning of the 1970s what she calls “an intoxicating mix of Marx and Freud, augmented by writings by such period gurus as Herbert Marcuse, Alan Watts, Paul Goodman and Timothy Leary had spread widely over the U.S.” (She is wrong, though, in thinking that “England was only just catching up” with these trends. If anything, it’s the other way round.) But she is right to argue that Levertov’s poetry wasn’t necessarily improved by her political allegiances, admirable though these were. On the other hand, her account of Levertov’s “Living”, which may well be, as Stevenson notes, “an end-of-the-world utterance, a hymn of farewell under pressure of war and multiplying technocracy to the miracle and beauty of life on earth,” is distinguished by “the sounds and rhythmic pulse of the lines”, the “unhurried duration” of its language, which have a claim to universality, one communicated precisely by poetic resources and not by a message, however well-meant and sincere. And this is true of all the poems Stevenson most admires. 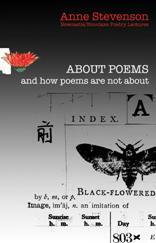 About Poems wants to make us better readers, keener hearers. Hence, the time Stevenson gives in her three Durham lectures to the analysis of poems by Frost, Elizabeth Bishop and Wallace Stevens. The tone is set at the very beginning of the first lecture, “How to Read Poetry,” where she says that her title might as properly be “How to Listen to Poetry,” because “much of it has to do with reading with the ear, reading, even if silently, slowly and out loud in the mind.” And she adds that her particular concern is with “how to read with a mind alerted to poetry’s special relationship with rhythm.” Oh, that boring old stuff I can hear some theorist mutter. To which the fit reply is, yes, that boring old stuff, about which, my fine friend, you know nothing, that boring old stuff without which there can be no poetry. Because, as these essays could reveal to you if you’d deign to read them, that’s what poems are about. Stern came to wide attention in the USA six years later, in 1977, when Lucky Life won the Academy of American Poets’ Lamont Prize, and from then on his work has been regularly praised and anthologised. In the Introduction to the volume which she has ably edited, Mihaela Moscaliuc notes that “Stern’s work reads as a poetic testament of accountability – one person’s, one writer’s, and, merging the two, one mind’s heroic squabble and love affair with the world.” And in an interview given to the American Poetry Review in 1984, Stern himself tells his interviewer that “everything depends on your signature, your breath, your person. Maybe your rhythm,” although Stern’s signature is, it should be added, both legible and reassuringly genuine..
It’s worth saying this because I suspect that on this side of the Atlantic Stern isn’t well known, if he’s known at all. It would be good to think, therefore, that Insane Devotion will help his cause with readers who have the good luck to come by a copy. All the essays are celebratory, many are informative, and quite a few make a persuasive case for Stern as a poet whom in Philip Levine’s playful, affectionate words, is a city himself, one of considerable variety and yet homogeneity, perhaps sui generis, although I hope it will help his cause if I say that he is in some ways like Levine, who is now, thank goodness – or thank Bloodaxe – known and increasingly if belatedly admired in UK poetry circles. 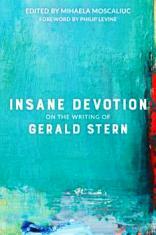 Stern’s Jewish heritage has a part, probably the major part, to play in the making of what Levine calls “the city of Gerald.” In her illuminating essay on Stern as “Jewish Poet and Tragic Comedian,” Alicia Ostriker asks us to “think of the dozens of [Stern’s] poems invoking pogroms and the Holocaust, often glancingly, on the understanding that [these] are simply part of the ordinary air one breathes, but sometimes sneakily, as in that masterpiece of memory, ‘The Dancing,’ where the murder of Jews is never mentioned.” Ostriker adds that the poem “is, or pretends to be, a poem of antic gratitude. It’s a poem of oxymorons piled high.” On this evidence, which is attested to by other poems Ostriker quotes, Stern is very unlike the late Jon Silkin, whose Jewish heritage led to the creation of poems from which all trace of the antic had been erased. Silkin’s characteristic tone was one that veered between, or should we say, mingled, violent outrage and cantor-like lament; he did without the tonal shifts and rhythmic swerves that Tony Leuzzi writes about in his essay on Stern. His comments on “Nietzsche”, from which he quotes the following lines, are especially a propos: “You can say what you want but I love Nietzsche most / when he stood between the terrified horse and the coachman / and intervened though I have pity for his sudden / madness even if he hated pity for he was / human then nor could one word matter anyhow”. Leuzzi notes that the absence of punctuation where we might expect it in these lines has “a fusing effect, where groupings of words are jammed together; this pushes the language forward yet slows one’s progress so as to make sense of the phrasing.” Stern, in other words, requires his readers to share the complex of mental processes which shape his consideration of Nietzsche. All in all Insane Devotion is a thoroughly worthwhile undertaking. Mihaela Moscaliuc deserves our thanks for assembling a collection of essays which between them help us to understand why Stern is a writer whose work really ought to be available to UK readers. Time, surely, for a judicious selection?